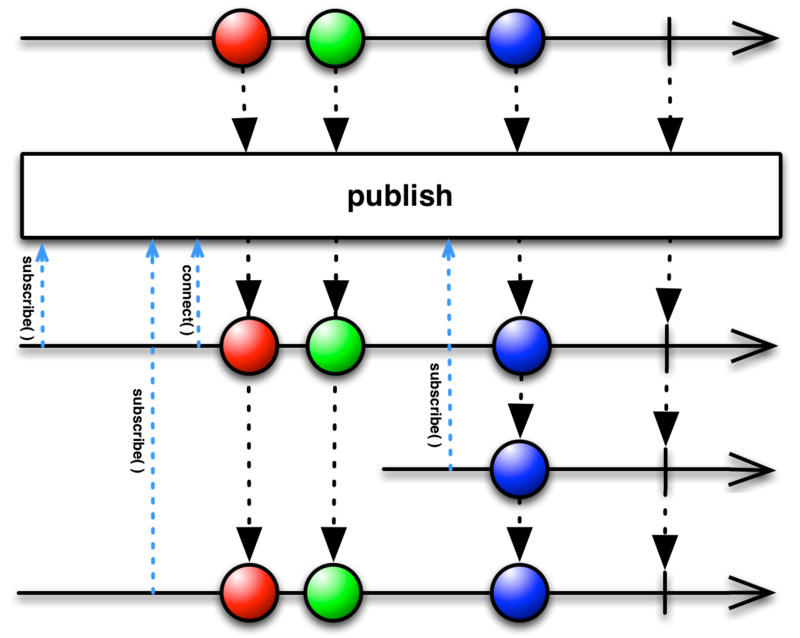 A connectable Observable resembles an ordinary Observable, except that it does not begin emitting items when it is subscribed to, but only when the Connect operator is applied to it. In this way you can wait for all intended observers to subscribe to the Observable before the Observable begins emitting items. In RxGroovy, the connect operator is a method of the ConnectableObservable interface. You can use the publish operator to convert an ordinary Observable into a ConnectableObservable. Call a ConnectableObservable’s connect method to instruct it to begin emitting the items from its underlying Observable to its Subscribers. The connect method returns a Subscription. You can call that Subscription object’s unsubscribe method to instruct the Observable to stop emitting items to its Subscribers. You can also use the connect method to instruct an Observable to begin emitting items (or, to begin generating items that would be emitted) even before any Subscriber has subscribed to it. In this way you can turn a cold Observable into a hot one. In RxJava, the connect operator is a method of the ConnectableObservable interface. You can use the publish operator to convert an ordinary Observable into a ConnectableObservable. In RxJS, the connect operator is a method of the ConnectableObservable prototype. You can use the publish operator to convert an ordinary Observable into a ConnectableObservable. The connect method returns a Disposable. You can call that Disposable object’s dispose method to instruct the Observable to stop emitting items to its Subscribers.